Pursuant to your request, we return to you herewith a letter memorandum agreement executed under date of June 29th, 1932, the purpose of your request for such return being that we have agreed that the additional period of employment therein agreed to apply after the 22nd day of December, 1934, shall have no application and that said contract shall be no longer extended thereby. In all other particulars, it is agreed that this memorandum of agreement has been carried out in full between us according to its terms and conditions. Kindly acknowledge receipt hereof in the left hand corner hereof, which will also serve to signify your understanding hereof to be as herein expressed. BY HENRY GINSBURG, Vice Pres. That the minimum working period provided for in the contract is hereby modified for and during said contract year to a minimum of forty weeks, instead of forty-eight weeks, as therein now provided, thereby permitting that you shall have a right to suspend for an additional period of eight weeks the use of my services; that such suspension of eight weeks, however, shall be a consecutive suspension and shall take place concurrently with a like suspension of eight weeks that shall be given to Mr. Oliver N. Hardy. That you shall give me as much notice as possible thereof, and, if at all possible, at least thirty days before the commencement of such suspension. In consideration thereof, it was agreed that the cancellation and/or termination clause contained in said contract shall be of no effect for and during said period of one year, and you shall have no right to cancel or terminate said agreement during said contract year, and there shall be paid to me pursuant to and according to the terms of said contract full compensation for and during a minimum period of forty weeks during said contract year and which we understand to be a total of three thousand dollars ($3,000.00) per week during each week of said minimum period of forty weeks, and one hundred dollars ($100.00) per week during each week of suspension during said contract year. The additional suspension period granted, however, shall not in any wise affect the provision in said contract that all my services are to be rendered exclusively for you, but you have agreed, in consideration of such additional suspension that said eight weeks suspension can be used by me for the purpose of personal appearance tours, stage appearances and stage productions, without, however, in any wise permitting my appearance in my capacity or in any manner whatsoever in any motion picture, photoplay or motion picture production of any sort. 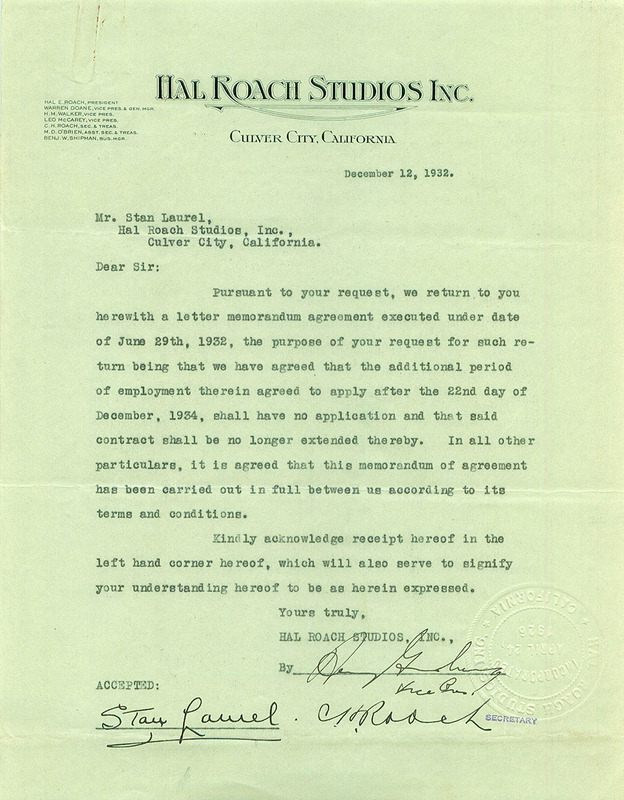 It is further agreed that in all other particulars said contract of January 7th, 1930, shall continue in full force and effect, and that the changes and modifications agreed to herein shall apply only in the contract year as aforesaid, commencing December 23d, 1932, and ending September 22nd, 1933. If this also meets your understanding of the arrangement, kindly to indicate on the line herein below provided.